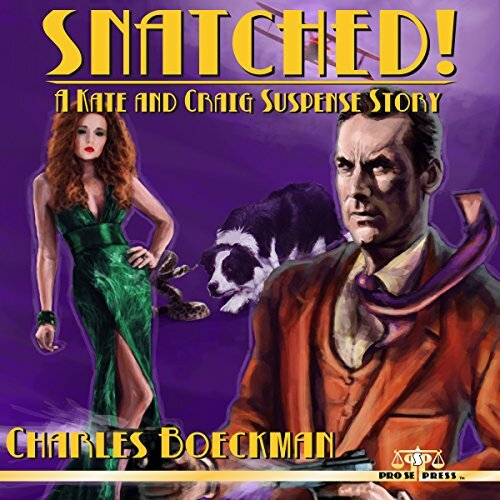 Noted Pulp Author and Mystery Writer Charles Boeckman’s final published fiction work is now available as an audiobook. Snatched! : A Kate and Craig Suspense Story published in print and digital formats by Pro Se Productions is also now an audiobook beautifully produced by Radio Archives! Snatched! : A Kate and Craig Suspense Story By Charles Boeckman from Pro Se Productions is the adventure of a pair of private eyes with much more in common than mystery and murder. In a Boeckman tale, action comes fast, one darn thing after another. Snatched! is a perfect example of Boeckman’s style. The mayor’s teenage daughter is kidnapped as she gets out of high school one afternoon. That presents problem number one for two Private Eyes, Kate McHaney and Craig Dawson. Find the kidnappers. But the problems keep on coming. A murder. And then a second murder. Sprinkle in a few shootouts when Craig blazes away with a pistol in each hand. Add in the love/hate relationship between Kate and Craig that keeps them entangled with one another. All that and more mixes together to make Snatched! : A Kate and Craig Suspense Story a sure fire New Pulp Classic right off the shelf. Featuring an exciting cover by Tery Pavlet and and action packed performance by Daniel Coker, Snatched! : A Kate and Craig Suspense Story is now available as an audiobook at Amazon at http://www.amazon.com/Snatched-Kate-Craig-Suspense-Story/dp/B0176O4UQ2/ref=sr_1_1?ie=UTF8&qid=1447200333&sr=8-1&keywords=Snatched%21%3A+A+Kate+and+Craig+Suspense+Story+audio. It is also available on Audible at http://www.audible.com/pd/Mysteries-Thrillers/Snatched-Audiobook/B0176PZ0SI/ref=a_search_c4_1_1_srTtl?qid=1447200350&sr=1-1 It will be available on ITunes as well. Print and digital versions of Snatched! : A Kate and Craig Suspense Story are also available at Amazon and other online retailers.